I did not want to go out on Wednesday, Nov. 23, 2016. We just had thirty-five plus inches of snow dumped in New Woodstock. NY... Madison County. I just got home from having some things removed at the Dermatologist feeling like I just got stung by a bunch of bees. My wife's family just showed up for Thanksgiving, and it was crazy. My wife coaxed me into getting outside, and my oldest daughter stopped me and reminded me how she used to rub my head for good luck when she was little... so she did. The dairy farmer we border up to called fifteen minutes after I left to tell my wife there was a buck and 11 doe in the field. Good thing she texted me because it stopped me from walking right into them. Unfortunately though, it forced me to walk in waste deep snow to get near them... quite the work out. I did manage to spook them anyway and they went running into the woods. Three separate times they came back out, without the buck, and got spooked each time. Finally, the fourth time only six came out. My phone died at this point, so I lost the ability to keep my wife posted on what was happening. I was about ready to call it quits anticipating the walk back in the deep snow, when I noticed a buck and two doe come out. He wouldn't come down towards me at first, but finally did. I shot and he ran about 50 yards getting ready to disappear into a hedgerow. My gun jammed, and when I finally cleared it I noticed the buck just sat down. All I could see was the top of his antlers moving around, no body or head. I didn't dare take another shot or go running up to him. I waited a good 20 minutes to finally walk up to him and discover what I had. I knew he was big, but not that big. He never showed up on any of my, or my neighbors, cameras or radar at all. By the time I dealt with him and processed everything it was well after dark. My wife couldn't reach me on my cell. I walked in the door and she was getting ready to meet her parents for dinner. She was ecstatic to say the least and helped me fire up the snowmobiles to get him out. 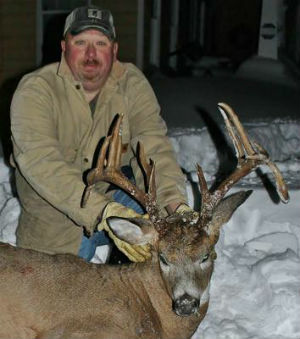 The buck had fourteen points total, eight on the right and six on the left, with a 20" spread. It weighed 150 pounds dressed. It has a single drop tine on each side as well. The meat processor and the taxidermist both commented how lean he was, easily losing 30 pounds plus in the rut probably. He was busy for sure. Hopefully he cemented his future here on our hill in New Woodstock.